Are you travelling for Christmas this year? Or did you just get home from a Thanksgiving trip? Maybe it’s appropriate that we travel so much this time of year remembering, as we do, Mary and Joseph journeying to Bethlehem, racing against time to find a safe place to welcome baby Jesus. In the coming season of Advent we are waiting for Jesus, too. 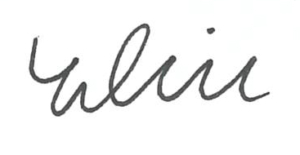 Each day of the calendar is like another step towards the manger: another step towards feasts with family; another step towards gifts of love; another step towards the announcement of angels: “I bring you good tidings of great joy.” The season has its share of detours—a monthlong cavalcade of parties and obligations, office functions and community events. But, in the end, all roads lead to Bethlehem. The journey is not unlike a labyrinth. It’s like a maze with twists and turns, but always returning to the right way, and always ending up in the center. In Christian history, the labyrinth was a way that cathedrals could offer pilgrimages for people—journeys with God—even though many could not travel far away. The labyrinth symbolizes that we are all on such a pilgrimage. This is how we would like to represent our Advent journey this year. 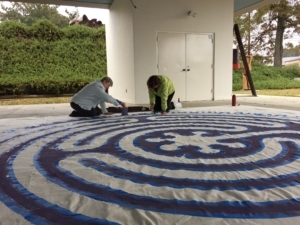 Our liturgical arts team has created a labyrinth to help guide our prayers and preparations for Christmas. We hope you will join us on Sunday, December 2 at 5:00 PM in the fellowship hall. There we’ll enjoy food and fellowship, and then an opportunity to explore the labyrinth, led by the Rev. 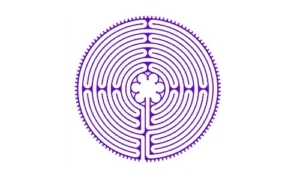 Julie Johnson, a spiritual director with extensive training in the spirituality of labyrinths. The labyrinth will be available for use in the sanctuary during the week; but with special resources available on Tuesday evenings in December. Come find the center of our journey as we prepare for God’s gift to us in Jesus.